Southern music has a unique flavor. Whatever the dominant genre, you'll likely find hints of soulful blues, Appalachian folk, and gospel blended together on the canvas of a front porch or juke joint where friends gather for good times, good food and tall tales. Sit back, pour up a glass of sweet tea (or your beverage of choice) and enjoy! I love music and anyone who knows me, knows this. In fact, I once said, if I had to do it all over again, my full time job would be in PR for either a record label or for bands. (Well I have worked with bands on their PR strategies in the past). I have to say that my love of music comes naturally, just riding in the car with my dad one could not help, but love music. I grew up listening to the sounds of Motown that’s the only music my dad allowed to be played in his car. I learned to appreciate Country music at my ma’am maw Kennedy’s house. When I stayed with my grandparents during the summers, our ritual was to watch The Grand Ole Opry reruns. The City of Birmingham used to host a three-day music festival called City Stages and I would plan my summers around the event because I attended every night. The event was held in downtown Birmingham and included all genres of music. The 21-year event ended in 2009 after some financial trouble. 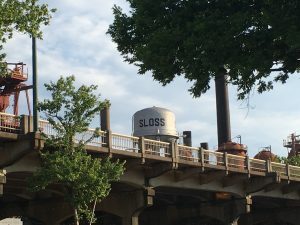 After the event ended, to me it has felt like the City has been missing something with no major music festival to attend until last year when the Sloss Fest Entertainment and Music Festival began. The event was held at the historic landmark Sloss Furnaces and it didn’t disappoint. I got the opportunity to attend this year. The festival was a learning opportunity for me because I had not listened to the music of some of the bands that played. Alabama has been on a fast track in the music industry lately so, it was exciting to again see Birmingham on display in the form of a music festival. 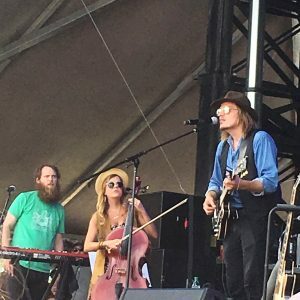 Our city was filled to the brim with visitors from all over who converged to listen to bands such as Ben Harper, Death Cab for Cutie, Dylan LeBlanc and Ray Lamontagne. The event took me back to the days when you could hardly move through the crowd at City Stages. In my opinion, an event like Sloss Fest only continues the positive renaissance and reboot of my hometown in the last couple of years. I tell people all of the time that I was a volunteer on committees for Operation New Birmingham and the things happening now are the things we WANTED to happen all those years ago when we talked about our city during committee meetings. How wonderful it is to see the transformation. Birmingham continues to receive accolades from all over about the quality of life, food scene and the strides it’s made in economic growth. Most who visit and spend any time in Birmingham come to know this, something I knew all along. Proudly, I am one of the biggest cheerleaders of Birmingham, so my hat’s off to the organizers of Sloss Fest. Thank you also for bringing (back) a great music festival that adds more Magic to the Magic City. The area also is home to the Tennessee Valley Authority a program that was formed to bring economic development to those in the Tennessee Valley that were suffering during the Great Depression. In the 1960s the area began to become known as the ‘Hit Capital of the World’ because of the music industry legend Rick Hall of FAME studios and the Swampers the session musicians who played on the hit records. 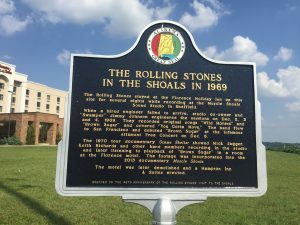 Many musicians travelled to this northwest corner of Alabama to make hit records, some names you may recognize like: The Rolling Stones, Aretha Franklin, Paul Simon, The Staple Singers, the Allman Brothers and the Osmonds. The area also is the home of the now historical landmark, Tom Hendrix’s Wall, a memorial wall he built to honor his great-grandmother and her struggles during her journey to Oklahoma and back to Alabama. She was a member of the Yuchi Indian tribe. The wall is located off of County Road 8 near the Natchez Trace. It is very spiritual place and you will feel its importance while you take a journey through it. If you plan to make a visit to the area make sure to watch the documentary ‘Muscle Shoals’ before going because it will explain a lot of what you hear in our discussion in the video below. My friend Dorothy Bloom Little and I visited the area last summer to take the ‘Swampette’ Tour and to visit Tom’s Wall. We hope you enjoy our discussion about our wonderful and meaningful road trip to the Quad Cities area. I am one of those “damn Yankees.” You know those Yankees who come here and stay. Being from Chicago I have always enjoyed the theatre and hoped that Birmingham would have some type of theatre district. My first experience with theatre in Birmingham was to see Wicked at the BJCC. It was a great performance, one of the many in the course of the musicals offered by the Birmingham Broadway series. After the performance at the BJCC, I attended performances at other theatres. I was totally hooked by the amazing local venues and the incredible performers. Red Mountain Theatre was a treat. The ambiance of a cabaret was delightful but what totally surprised me was the caliber of the actors. The local talent is terrific and the shows are great. Not only have I seen several performances there but I have also taken my grandchildren to the children’s theatrical productions. My granddaughter was enthralled as we sat front row center for one of the performances. Now she keeps asking, “Nana when are we going to that theatre again”. Another venue I have gone to is the (TNT) Terrific New Theatre. Seeing a performance there is like seeing it while sitting in your living room. It is a small theatre with a big heart. Once again the local talent just blew me away. Actually as I discovered some other venues I have realized that Birmingham has some excellent actors. Musical, comedy, drama Birmingham folks can do it all and do it well. 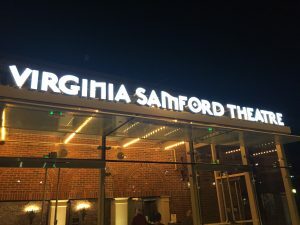 A couple of other theaters I have had the opportunity to visit are the beautiful new Jemison Concert Hall, the Virginia Samford Theatre and the Alys Stephens Center. I have yet to see the renovated Lyric Theatre, but I am looking forward to my first performance there. I just could not finish this article without writing about what I consider to be a real gem, the Alabama Theatre. The charm of a previous era is everywhere. The entrance, the seats, the walls, the boxes, the lighting, even the ladies salon, which has red velvet lounges, all of it exudes elegance. As I walked into the theatre and looked around it reminded of a theatre in my hometown, the Chicago Theatre. Although, I must admit it surpassed the Chicago (dare I say it) because it has that awesome Wurlitzer organ. This Queen is the frosting on the cake of the theatres here. And to me the best is going to any performance and knowing that the actors will never disappoint. Kudos Alabama. 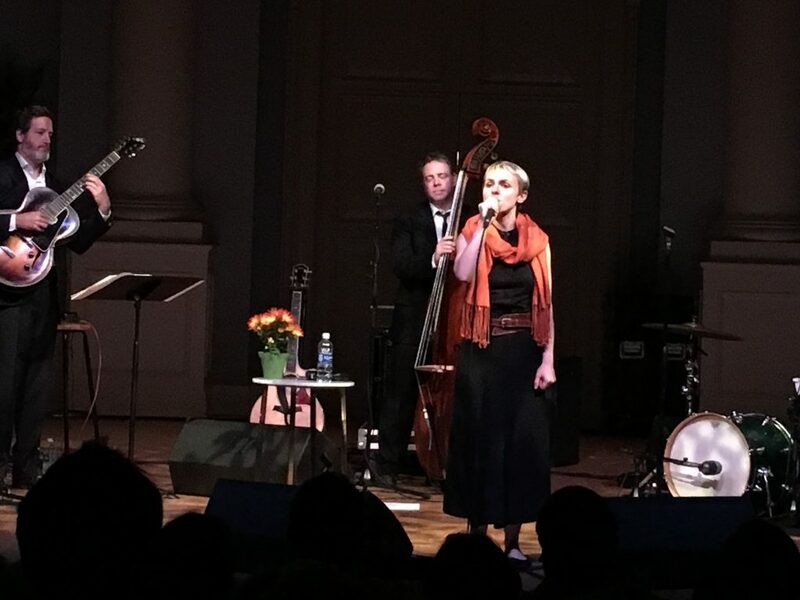 It’s no secret that I love all kinds of music and I take the opportunity often to see as many perform as possible. Some friends and I went to Local Color, a quaint music hall and café in Springville, Alabama off of Highway 11 about 30 minutes north of Birmingham. Local Color Café is owned by Merle Dollar, who is a vocalist and a visual artist, and whose art is displayed throughout the café. The doors of the venue open at 6 pm, which is dinnertime according to the café’s Facebook Page. There are no menus, only a white board listing the evening’s entrées with the qualifier, “as long as they are available.” Each entrée is served with homemade cornbread. Around 7:00 or 7:30 pm Merle comes out of the kitchen for the pre-show, with her distant cousins, Sylvia and Peggy, known as the Something Else! Trio. The cousins grew up singing in choirs in church and Merle sang with rock n roll bands and then in theatre performances such as Oklahoma. 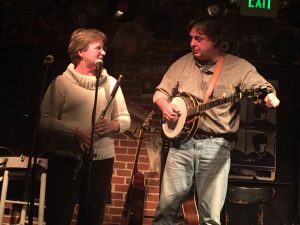 The main musical act comes on around 8pm and those acts are usually well-known bands from around Alabama and the music can range from gospel, to bluegrass, to folk and rock ‘n’ roll. The Celtic Band, Chambless & Muse, performed last night. Scooter Muse is the Muse part of the band and often plays with my friends, The Wildwood Ruminators in Muscle Shoals, Alabama. It was a real treat to see them last night. I tried something new with the ‘live’ streaming app Periscope as part of my blog which allowed me to ‘live’ stream a couple of Chambless & Muse’s songs. Don’t worry, I asked permission of the musicians first. One of the more valuable things you get from listening to live music around the state is that you get to meet some incredibly talented musicians and their fans who follow them. In June 2014, I had the opportunity to get to know one of my now closest friends, Dorothy Bloom Little while attending the Helen Keller Festival in Tuscumbia, Alabama. Dorothy and her friend Nancy are huge followers and friends of The Wildwood Ruminators. Dorothy is far from Southern (she is from Cleveland, Ohio by way of New York City), but I’ve had a great time introducing her to various parts of the state, that if one, is not from here, wouldn’t know existed. Dorothy and I like to banter back and forth on various topics such as Southern cooking, as noted in the video below. I am grateful that music has given me the opportunity to meet people who have similar interests as mine.